This dish that I am sharing with you today is similar to Nilagang Baka (literally translated as Boiled Beef) which I featured here in February, the only difference is the kind of meat used. 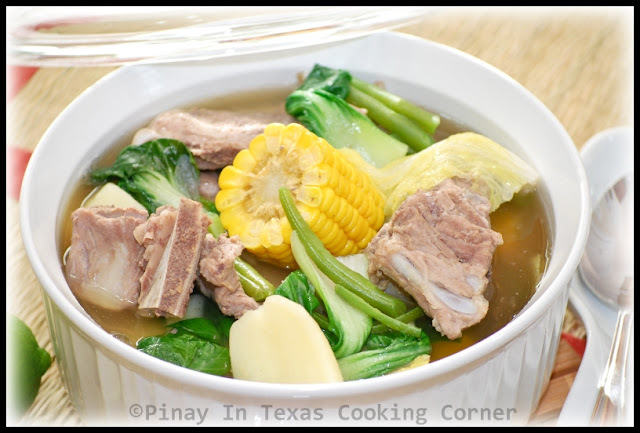 This one has pork neck bone (and I added ginger so this tastes a little like tinola) and this version is what I used to cook so often when I was in college. Not only is pork neck bone a lot cheaper than beef, it also cooks faster. But just like beef, pork neck bone also produces a very comforting soup which when served with a hot bowl of rice can be truly soothing! I am sure that you'll agree with me when I say that going away to college is a big step especially for those who have to leave the comforts of their own home. It means no more parents to keep after you to do your homework or to clean your room, and added responsibilities of being independent like having to do your own laundry, go shopping and cook for yourselves. I was lucky enough not to experience that during the first few months of college! Even though I went to a university which is a 3-hr boat ride, 2 ½-hr bus ride plus 20-min jeepney ride (approximately 87 miles) away from home, I had my mom and my older brother with me, so it wasn't that of a BIG change for me. That time, my dad usually worked out of town during the week so my mom decided to just stay with us in Manila. We rented a room in a relative's house, and it was really good having my mom to do everything for us. But that didn't last long. My dad got sick around September and so my mom had to go back to the province. It was like a whole new world for me. Came with it was the responsibility of cooking and doing the laundry for me and my brother. I didn't know a lot of recipes that time, and with all my university activities as class president, OASES (Organization of Aspiring Students for Engineering Specialization) representative and Thomasian Engineer (College of Engineering newspaper) technical writer, I didn't have time to do experimental cooking, so I oftentimes found myself just buying food for us from McDonald's, Jollibee or Cindy's. And during days when we're almost running out of money, we contented ourselves with Lucky Me Instant Mami or rice with Filipino red hotdogs or canned foods like Century Tuna, Ligo Sardines and Argentina Corned Beef. After a few months of having those kind of food over and over again, my brother and I decided that we need something healthier and cheaper. We agreed to go to the supermarket and cook together on weekends (I must point out that he was just actually watching me cook), store cooked food in the ref/freezer and just heat it up in the microwave during the week. Pork Adobo, Chicken Afritada, Pork Steak, Pakbet Tagalog, Cardillong Isda, Filipino Sweet Spaghetti, Ground Pork in Tomato Sauce, Chopsuey and this Nilagang Pork Buto-Buto were among those that I frequently cooked. These are all easy to cook Filipino recipes that my brother and I both find so satisfying. But the Nilagang Pork Buto-Buto was my favorite. I can always adjust the ingredients to our budget. It can be as as simple as garlic, onions and potatoes and it can be as grand as this one with all the vegetables I want in it. I also like it because it takes almost no effort at all to cook this dish. You just put everything in the pot and let it cook. A very simple and yet so good and nourishing dish! For me, it felt like slurping the broth, and dripping a few drops of fish sauce and freshly squeezed kalamansi juice over the tender and flavorful meat sliding off the bone can take away all the stress of a typical day in college. 1. Place pork neck bone in a big pot . Add about 10 cups water and bring to a boil over medium heat until scum appears on the surface. Remove all the scum or brown bubbles that will form on top of the soup. 2. Add garlic, ginger and peppercorns. Cover and simmer until pork is almost tender, approximately 20 minutes. 3. Add fish sauce, onions, corn cobs, potatoes and green beans. Simmer until vegetables are almost cooked (approx. 10 minutes). 4. Add napa cabbage and baby bok choy. Add salt to suit your taste. Simmer until vegetables are cooked but still crisp. 6. Remove from heat. Serve hot! Though my brother and I survived those months without our mom with us, I guess things could have been easier for me if we had internet access back then. With only one old Filipino cookbook that time, finding other easy, affordable college student-friendly recipes on the internet could have been a great help. I could have enjoyed cooking more if affordable recipes like these were available to me instead of having to go through every page of my mom's Filipino cookbook to check which recipe has pocket friendly ingredients! 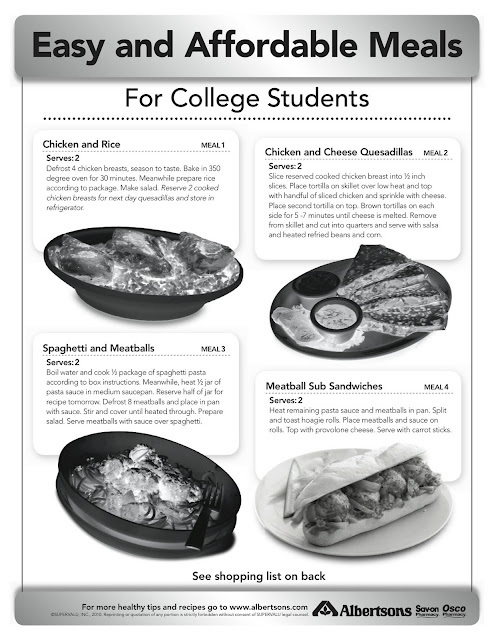 I really love that Albertsons came up with this "Easy and Affordable Meals for College Students". 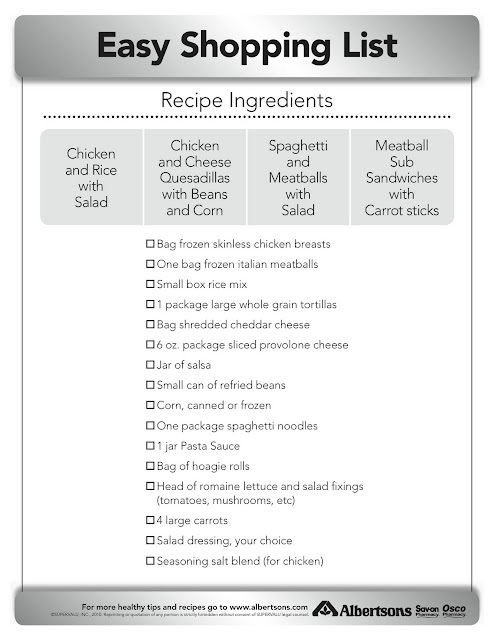 It's such a great way to help college students (or just anyone) who want to plan a healthy meal on a tight budget. Albertsons dietician, Heidi DIller has been working on their healthy eating campaign. With her mission of providing Albertsons' customers and associates with inspiring health as well as value-oriented solutions they can incorporate into their shopping experience and everyday lives, she came up with this Easy and Affordable Meals for College Students. And guess what! The awesome people at Albertsons is offering you, my precious US readers (apologies to my non-US readers) an opportunity to win one of two $25 Albertsons gift cards that you can keep for yourselves, or send to someone you know who is just starting out at college. What could be better than having to try this recipes for free, huh!!! 1. Leave a comment on this post telling me about what you think about my soup dish or about the fondest memories you or someone you know had in college. 2. 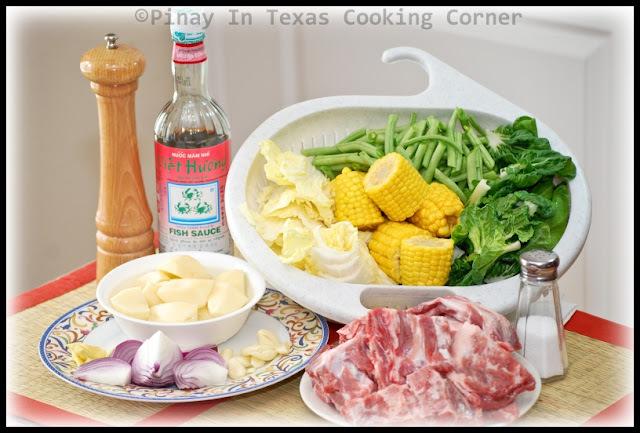 Follow Pinay In Texas Cooking Corner on GFC, and leave a comment here. 3. 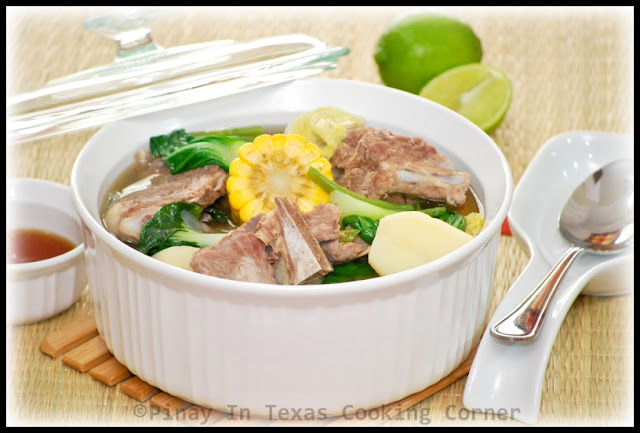 Like Pinay In Texas Cooking Corner on Facebook, and leave a comment here saying so. 4. Follow PinayInTexas on Twitter, and leave another comment here stating that you are following both. 5. Post about this giveaway on Facebook and/or tweet about it, and leave a separate comment here stating you have posted or tweeted about this giveaway. You can have a total of 5 entries. Just don't forget to leave a separate comment for each. This giveaway will end on October 6, 2011 (Thursday) 9PM CDT. Two winners will be chosen via random.org who will each receive $25 Albertsons gift card. Nice to read about your college life. The soup looks hearty and delicious. nice giveaway too. What a comforting soup indeed! Especially with the addition of the ginger. And I love the pieces of corn cobs. Glad we survived those college years! I am simply into soups Tina like this one you made but minus the pork but am sure some chicken pieces can be added inside. Sounds like a very comforting soup especially at this time of the year with the cooler temperatures! Wonderful giveaway as well! I enjoyed reading your post about your college days, Tina. Such a delcious and comforting soup. Nothing beats the nilagang buto-buto because of the broth that it creates combined with the flavor from the veggies. Oh, you're making me hungry, Tina! This giveaway is now closed. Winners will be announced in tomorrow's post.